In today’s hyper-competitive online market, creating a business that truly stands out from the crowd can be a challenging endeavour. Of course, you already know the value of choosing the perfect niche, optimising your on-site SEO, and developing the voice and personality of your brand. Yet all your competitors will, quite rightly, be following the same advice, so you will need to find new and better ways to stay one step ahead. This is where app development comes in. At first glance, this may seem like an ambitious step. After all, what sort of return can you expect from a business app, and what value could an app offer to your customers? Yet, whether your business is a brand new startup, or an established ecommerce enterprise, there are many ways in which a well-thought-out app could benefit you. As online mobile usage soars, the most obvious upside to having an app is that it offers you a more direct connection with your customers. But not only does this allow you to reach your audience whenever you choose, it is also a means for them to reach you. Advances in artificial intelligence have made it feasible for business applications to incorporate natural language interfaces, making it even easier for consumers to get the most out of your app. The use of this technology, sometimes termed conversational commerce, is a great way to show off your brand’s up-to-the-minute modus operandi, while simultaneously making your job easier. Encourage dialogue between your customers by integrating features such as in-app commenting and messaging. Not only does this allow your audience to connect with like-minded individuals, but also allows them to foster each other’s enthusiasm. As people share ideas and positive experiences, they generate social proof for your business, making it seem more trustworthy and familiar to other potential customers. The ability to consume content while on the move is highly valued in today’s mobile world. While a large percentage of people still consume content primarily from a PC or laptop, it is vital not to overlook your mobile users. An app gives customers an easy means of interacting with your business without even needing to type in a web address. Everything they need, including a direct link to your website, can be right there in the app. In addition to encouraging social interaction within your app, by integrating a user’s email and social media accounts, you enable them to share their interactions with your brand more easily. In addition, this added connectivity can provide you with a significant amount of user data, which can be used to improve recommendations and targeted marketing efforts. Having a loyalty rewards program in place is a brilliant way to give something back to your regular customers, and a great means of encouraging repeat business. With an app in place, this is made even easier, as you can manage your loyalty scheme and the distribution of rewards, all via the app. This can even serve a dual purpose by encouraging customers to download your app in order to participate in your rewards scheme. Using features such as geotargeting and geofencing, your app could not only help users find their way to your business, it could even alert them when they are in close proximity to an outlet or branch offering something in which they have shown an interest. This feature can also be used to notify users of new outlets opening in their area, or of location-specific promotions. The increased engagement afforded by a business app gives you a fantastic opportunity to build on your brand’s image. Your app will contain only information and aesthetics that you have chosen to present to the user, giving you significant scope to tailor your message effectively. The more recognisable and established your brand becomes, the more trusted it will be, leading to increased sales and a stronger industry presence. Anyone who has downloaded your app has already become engaged with your business on some level. This means that any marketing you choose to do via your app is going to an audience that is already interested, and therefore more likely to respond to your CTA, buy your products, or use your services. If your business offers a service rather than a physical product, there is still plenty to gain from having an app. Users could make and manage appointments via the app, receive reminders, and even process payments, without needing to trawl through emails or call customer service. For regular customers, the app could even suggest dates for the future, or remind users when it approaches the time that they would normally book their next appointment. This ease of use encourages engagement and repeat business by making it as easy as possible for clients to manage their schedules. Even with first class SEO and a killer marketing campaign, it can be difficult to get your business noticed amidst the hundreds of thousands of websites all competing for the attention. In contrast, an app needs to win out against a far smaller number of competitors, especially as targeted recommendations within most app stores are more likely to suggest your app to its intended audience. All this extra exposure, combined with the ease of use of a mobile app, means you have a much greater chance of capitalising on leads. Whether you have a service-based business, a bricks and mortar retail outlet or an ecommerce store, effective targeting of your marketing content via a carefully-crafted mobile app is a great way to drive sales. This could include promoting specific products via the app, offering tailored promotions, or even allowing users to select certain items as rewards in your loyalty scheme. Cashless transactions are the epitome of convenience for the mobile computer, and the lifeblood of any ecommerce business. Enabling mobile payments through your app adds a further level of convenience for your customers, and may be perceived as more secure. Many consumers feel more confident typing financial details into an app than they do on a website. In addition, this ease of use makes repeat business more likely, while simultaneously providing you with valuable transaction data. This data can help you to offer a more personal service to each of you customers, and even protect you against fraudulent activity. One of the more expected features of an app is that it should keep users up-to-date with important events, such as sales, competitions, and product launches. For example, an ecommerce app could remind customers of items left in their basket, notify them of offers on their top products, or even send them personalised discount codes. The power of push notifications is not to be ignored. In fact, timely notifications can increase app retention by up to ten times according to a recent study by Urban Airship. Of course, these notifications still need to be perceived as valuable by their recipient, so this is the perfect place to use some well-crafted copy, and targeted advertising. Younger demographics may be easier to reach via an app as they are more likely to prefer to engage with your business in this way. 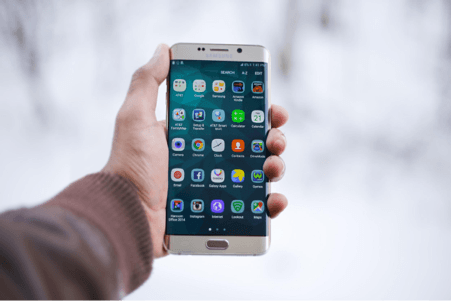 As business apps become the norm, it may even count against your organisation if you do not have one, as for some consumers this may be their preferred means of communicating with the businesses they use. Once you have an idea of what your app should do, you will be able to liaise with developers to find the right combination of features to meet your needs. The world of software development is always moving forwards, so innovative new app solutions are being created all the time. As such, with the right guidance, and a clear picture of what you hope to achieve, you can launch an up-to-the-minute business app that offers everything your customers need, while simultaneously boosting your brand’s reputation and professional image. Victoria Greene is a ecommerce expert who loves to help young businesses flourish. She’s also a freelance writer and runs her own blog at victoriaecommerce. Big advocate of using software strategically to boost business growth. Great article and well written. Embracing mobile technology is a dead cert for competing online. I have several questions on this though from a SMB perspective. Would a small business selling niche products benefit more from an App or a Responsive Website? What marketing techniques would you find most successful for App downloads as I would be hesitant on paying for an app when it may not even be used? Hi Mal, glad you enjoyed my post! I believe a small business should focus on making its website responsive as a first priority and then advance into app development from there. Creating a responsive site can be a great help for SEO and will enable a site reach many more users through organic search. The best place to start when marketing an app would be to promote it to your current customers, maybe through an email marketing campaign. You could also consider paid advertising such as social ads to drive downloads at scale.